My son accompanied me to the office a few months back. I had some work to do on a Saturday. "Can I use the SMART Board, Daddy?" The Port Authority donated a SMART Board to The Works a year ago. I've preached the need to get these things into the classrooms in Licking County because they are ever-present in the boardrooms and workrooms of Licking County businesses, particularly that of the Port Authority's largest customer, Boeing. I believe its important to get school resources that match the business needs of the community. So, how could I deny my own child? 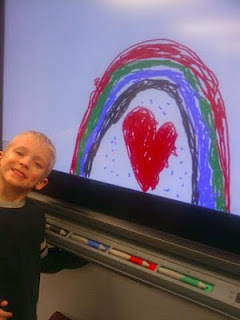 Brooks has had a SMART Board in his classroom in both Kindergarten and First Grade. I came back to make sure he hadn't misused or abused the thing (and cost me $$$ to replace it). He had created a work of art with no mess and no problems. Wow. The Port Authority uses the SMART Board in our boardroom for prospect briefings, board meetings, and a host of interactive functions. In fact, and I applaud the innovativeness of my staff for this, we did a bid opening last month on the SMART Board where everyone in the room could see the bid numbers as soon as they could be typed in. Everyone left with a print out. We've only touched the surface of its application. Brooks found it to be a useful art pallet. The SMART Board had made the boring task of coming to Daddy's office more fun. SMART Boards, when used to teach kids in ways that go beyond paper worksheets on their desks, can make a boring classroom more fun too. My wife had me read a Parenting magazine article about high-tech, active learning. "What's great is that SMART Boards reach kids who need to be physical, kids who are visual learners, and even those who are auditory learners," said a first-grade teacher from New York. She's right. That article only reinforced my belief in SMART Boards as a tool to bridge our classrooms and our boardrooms. Hurray for active learning--from preschool to retirement, and beyond.